Many users have reported problems resizing Legacy. When you attempt to resize the window it rebounds back to what it was. 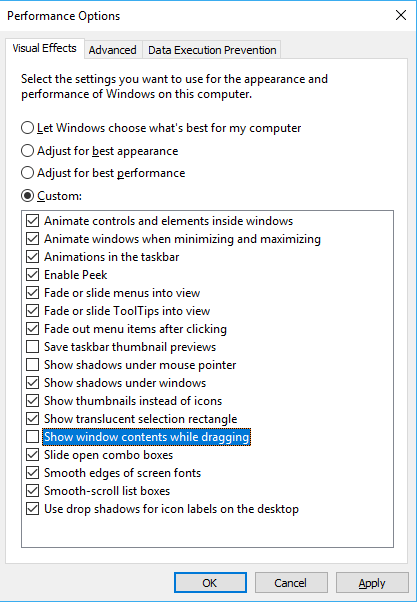 To fix this turn off the Windows 10 Appearance & Performance Option setting "Show window contents while dragging" as shown in the screenshot below. - Click Windows "Start" at bottom left on your toolbar and begin typing Appearance. - Click "Adjust the appearance and performance of Windows"
- Go to tab "Visual Effects" and turn off "Show window contents while dragging"
- "Stretch fonts when resizing" to ON. We have also had users report that if you close the database but not Legacy (file>close file in Legacy) it reduces the number of redraws and thus reduces the problem with resizing.